Just west of the old Antlers Bridge are two bridges at the mouth of Doney Creek. The bridge in the foreground is a Southern Pacific Railroad (deck truss) Bridge. Just behind it is a pretty arch bridge (6C0052) carrying Lakeshore Drive over Doney Creek. The highway bridge was built in 1927 by Harlan D. Miller. It includes a 182 ft long spandrel arch main span. 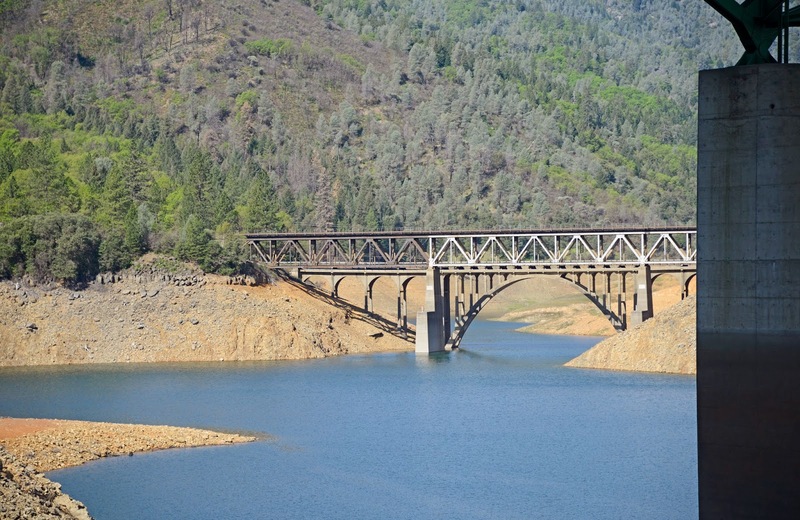 Both bridges had to be raised when Shasta Dam was built across the Sacramento River in 1940. Of course, after several years of drought, the creek is close to its original elevation. Shasta County, California Bridges: Doney Creek Bridges (1) by Mark Yashinsky is licensed under a Creative Commons Attribution-NonCommercial-NoDerivatives 4.0 International License.